Western Digital 4TB My Cloud Personal Storage Hard Drive makes it easy to back up all your important files on all your devices: mobile devices and computers. You'll definitely regret it if your computer crashes and you lose everything: documents, photos, movies, music, etc. So don't let that happen to you. It's a small price to pay to back up your digital life: your valuable files are worth more than the cost of the drive and you can back up not just one device but several devices. Also, I like how this external hard drive comes with software that will allow you to set scheduled automatic backups, so you don't have to do it manually. This can be done over wifi - it's like having your own personal Cloud storage (ie Dropbox)! It allows you to access your backed up files from anywhere as well. 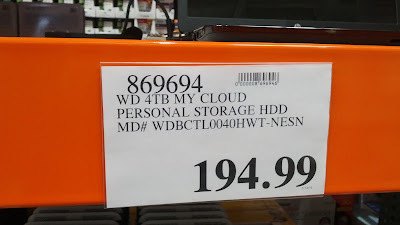 Back up your photos, documents, and home movies in case your computer crashes with the Western Digital 4TB My Cloud Personal Storage Hard Drive. 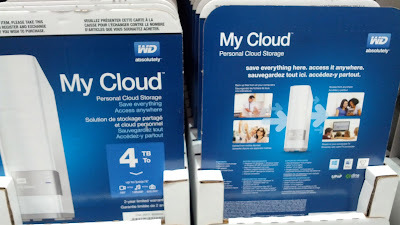 With 4 TBs, the Western Digital 4TB My Cloud Personal Storage Hard Drive gives you plenty of space for your files and automatically backs them up. Personal Cloud Storage. Save everything. Access anywhere. Finally, a cloud of your own. Save everything in one place and access it anywhere from computers, tablets and smartphones. Your files on your own personal cloud - Unlike public clouds, My Cloud allows you to keep all your content in one safe place on your home or office's network instead of a remote server. No mysterious location of your data. No monthly fees. No limits. Just blazing-fast performance for your high-speed digital life. Secure access from anywhere - Access your files from anywhere on your PC, Mac, tablet or smartphone. Automatic file backup for all your computers - Easily back up the files from all the PC and Mac computers in your home or office.